Racin’ Today » Young Fetcho To Become Taylor Swift Of Racing? Young Fetcho To Become Taylor Swift Of Racing? 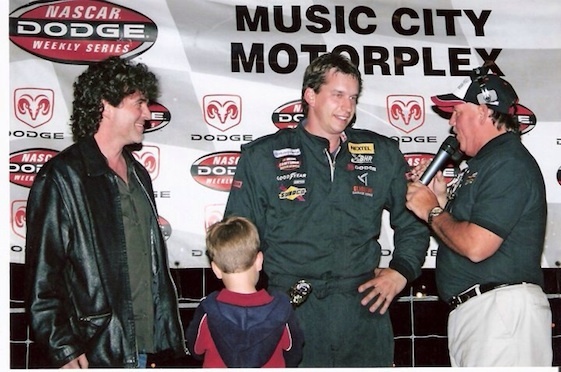 Prominent music producer Scott Borchetta, left, joins Scott Fetcho, center, in Victory Circle following a race at Fairgrounds Speedway a few years ago. This season Borchetta will sponsor the race car of Fetcho's son Dylan (with his back to the camera), now 13. NASHVILLE – Teen-age racer Dylan Fetcho hopes Scott Borchetta can do for his racing career what he’s done for Taylor Swift’s singing career. Borchetta, founder and owner of Big Machine Records, discovered Swift several years ago when she was 14, and helped turn her into one of country music’s biggest stars. Now he is taking a similar interest in the fledging racing career of 13-year-old Dylan Fetcho, sponsoring his cars this season and in 2015. The sponsorship comes at a time when local-division tracks are struggling and sponsorships are drying it, making it difficult for young drivers to kick-start their careers. Borchetta, whose Big Machine Records lineup includes some of the music industry’s biggest stars – Swift, Tim McGraw, Rascal Flatts, Reba, Florida Georgia Line and many others –has had a life-long interest in music, and an equal passion for racing. He won three track championships as a driver at Nashville’s Fairgrounds Speedway two decades ago, and was co-sponsor of the Indy 500 car driven by the late Dan Wheldon. This season Borchetta is sponsoring a 24 Hours of Daytona car fielded by Ganassi Racing, in addition to Dylan Fetcho’s Legends and Quarter-Midget cars. Borchetta is enthusiastic about his involvement with Fetcho’s race team. Scott Fetcho built Borchetta’s first Legends race car 16 years ago, and the two have been associates ever since. Borchetta sponsored a car that Fetcho drove in 2006, his final season of racing before stepping aside to assist his son with his career. It was about that time that Borchetta began promoting a teenaged singer named Taylor Swift, and predicted that someday she would be a superstar. Fetcho hopes Borchetta can work the same magic for his son. Dylan, who attends school in his hometown of Lebanon, 30 miles east of Nashville, will contend for the Legends championship at Highland Rim Speedway this season, and compete in a limited schedule of races at Fairgrounds Speedway. He will also run approximately 12 races in the Quarter-Midget Series at various tracks around the country. Next season he will make his debut in the Late Model Series, again with Big Machine Records as a sponsor. His ultimate goal is to compete in NASCAR’s top series. Borchetta will attend as many of the races as his schedule permits.